March 18-24 is beauty week at Whole Foods Market! This year to celebrate they have introduced a beauty bag full of delightful products worth $60 for only $18 in store. Fair warning quantities are limited and each store is holding a bag release party on March 21 at 10am. Whole Foods Market has set high standards for the body care industry based on the philosophy what you put on it, you put in it. We purchase many of our body care products at Whole Foods. 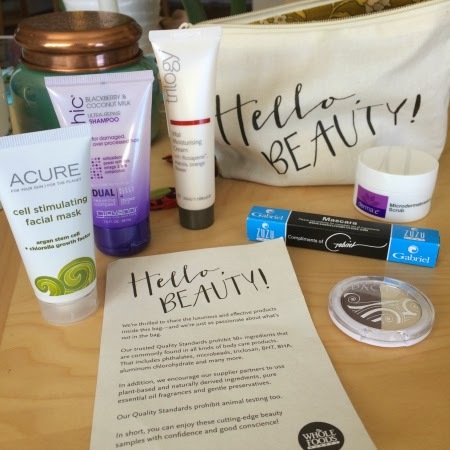 I do love the release of the beauty bag and having the opportunity to try out products on my rather sensitive and fickle skin. Even the bag is high quality, it is made in India by an organization that provides jobs to survivors of human trafficking. The women receive health care, literacy training, day care, and a fair wage. On that note, I've actually decided to deactivate my monthly more traditional beauty bag subscription, and instead pick up Whole Food's quarterly bag.